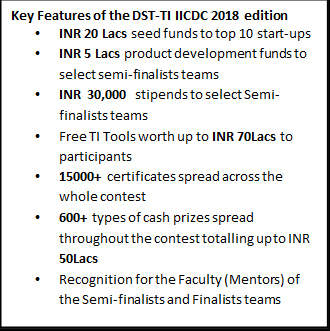 India, Bangalore, June 20, 2018: Texas Instruments (TI) today announced the upcoming edition of DST – TI India Innovation Challenge Design Contest (IICDC) which opens for registration from June 20, 2018 till Aug 31, 2018. A dedicated TI-IICDC page was launched on MyGov portal by Dr. Anita Gupta, Advisor and Associate Head-NSTEDB, Department of Science and Technology, Professor Suresh Bhagavatula Chairperson, NSRCEL, IIMB and Mr. Sanjay Srivastava, Director, Texas Instruments India University Program at IIM Bangalore today. Students can register their innovative ideas and participate in the contest through this link: https://innovate.mygov.in/india-innovation-challenge-design-contest-2018/ . The Ministry of Science and Technology (DST) and Texas Instruments extend support to the qualifying teams with a fund of INR 8.2 crore, which marks a significant increase from INR 4.14 crore as compared to the previous editions. This edition also provides the opportunity for the Indian engineering students to earn 15,000+ certificates across various stages of the contest. DST-TI IICDC, which is in its third edition, has undergone a remarkable change to be one amongst the most popular innovation contests for Indian engineering students and colleges. In the 2017 edition, 15,380 engineering students from 965 colleges participated, a 43% growth versus 2016. The uniqueness of this contest lies in the partnerships and collaborations that TI has built to create a complete innovation ecosystem for the participants. “With the launch of DST-TI IICDC we plugged a stark gap which existed in the ecosystem for Indian engineering students to venture into entrepreneurship with the right support structure. While all teams aim to win, it is the journey of transforming an idea to reality that students value the most. They also acquire immense learning, with rewards along the way, being mentored by leading minds from TI including networking with other student engineers, and winning several cash prizes and certificates. Our attempt is to create an immersive ecosystem for innovation that challenges students every step of the way,” says Sanjay Srivastava, Director, TI India University Program. IIM Bangalore’s NS Raghavan Centre for Entrepreneurial Learning (NSRCEL) will help incubate the winning teams and support them in the launch of their venture. TI spearheads this massive operation of the contest along with providing technical guidance and mentorship, free TI tools worth up to INR 70 Lacs, INR 50 Lacs prizes and 15,000+ certificates to the participants. Dr. Arvind Gupta, CEO, MyGov, said, “With its enormous ability to bring more than 6 million citizens to partner with Government, MyGov is excited to partner with DST and TI towards bringing new generation of budding engineers to strengthen the innovation index of our country. It will also help MyGov to play a stellar role in developing, supporting and spreading the digital ecosystem of India and enabling the millennials to lead a new dawn of Digital revolution in the country”.